These Low-Carb Glazed Sugar Cookies are a delicious and keto-friendly baked good that is sure to satisfy your sweet tooth! 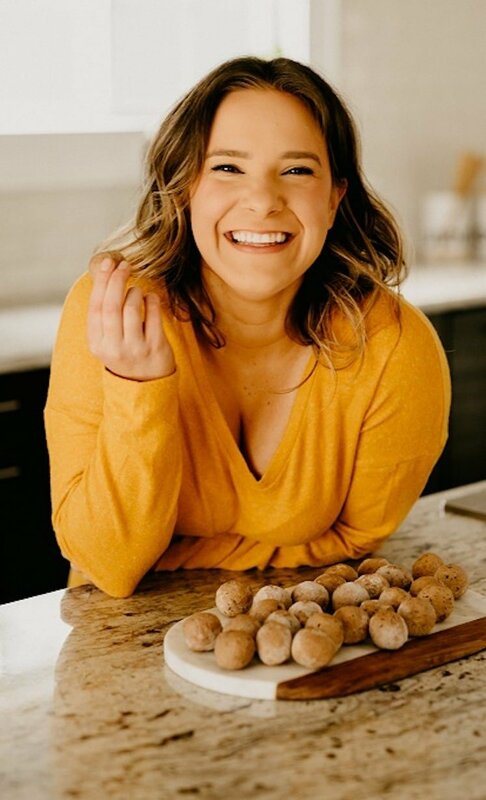 Have you noticed that I am allllll about low-carb baked goods? It’s my personal belief that eating a low-carb diet is the cornerstone to good health; however, I refuse to give up my love for desserts! In knowing that, I have loved to develop and share low-carb dessert recipes that are keto-friendly and full of flavor (many of which are also paleo- and/or primal-compliant!). These cookies in particular are one of my recent additions to my long list of favorite low-carb desserts! 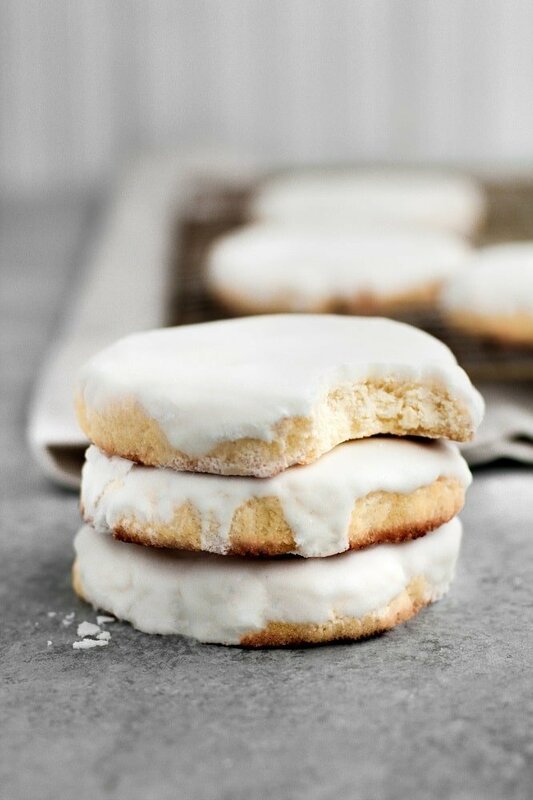 These Low-Carb Glazed Sugar Cookies are soft, sweet, and a perfect after-dinner treat! They contain minimal carbs per serving and are also paleo-compliant, dairy-free, and nut-free! Like many of my recent dessert recipes, these cookies are made with coconut flour rather than almond flour, which many keto and paleo baked goods contain, making them entirely nut-free and safe to consume for those with a nut allergy and nut intolerance. These cookies are sweetened with Lakanto Classic Monk Fruit Sweetener, my favorite keto-friendly and all-natural sweetener. I almost exclusively use monk fruit sweetener in my low-carb dessert recipes and fat bomb recipes as I find it has the best taste and incorporates perfectly into recipes. If you need to re-stock your pantry or if you’ve never tried monk fruit sweetener, I highly recommend it! You can use code “REALBALANCED” for 20% off your Lakanto order! 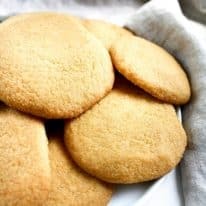 These Low-Carb Glazed Sugar Cookies are a perfect dessert recipe to bake up, especially when you are cooking for someone who follows a low-carb, nut-free, and paleo diet! Low-Carb and Keto: One cookie contains only 1.5 grams of net carbs per serving. Nut-Free: These cookies contain coconut flour and are entirely nut-free. Dairy-Free: Coconut oil and coconut milk are used in this recipe, making these cookies safe to consume for those with a dairy allergy or lactose intolerance. Refined-Sugar-Free: Sweetened with natural monk fruit sweetener, these cookies do not contain any refined-sugar. One cookie contains 1.5 grams of net carbs per serving. 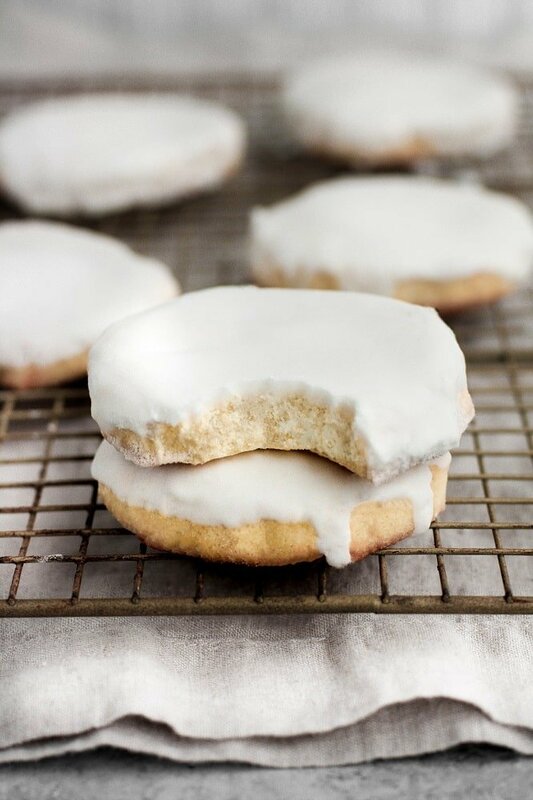 These Low-Carb Glazed Sugar Cookies are low-carb, keto, nut-free, paleo, dairy-free, gluten-free, grain-free, vegetarian, and refined-sugar-free. You can find more nut-free and low-carb Real Balanced recipes here! 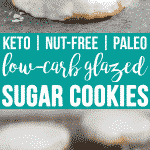 These Low-Carb Glazed Sugar Cookies are a delicious keto-friendly baked good that is perfect for curbing your sweet tooth! 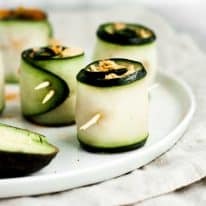 This recipe is low-carb, keto, nut-free, paleo, dairy-free, gluten-free, grain-free, vegetarian, refined-sugar-free, and contains only 1.5 grams of net carbs per serving! To a mixing bowl, add coconut flour, monk fruit sweetener, shredded coconut, cream of tartar, and baking soda. Whisk until all ingredients are fully incorporated. Add beaten eggs, coconut oil, and vanilla extract. Mix with electric mixer until wet and dry ingredients are well-combined. Form dough into 8 equal balls and place on prepared baking sheet, lightly pressing down on dough to flatten. Bake until edges are golden brown, about 18-20 minutes. Remove from oven and transfer to cooling rack. 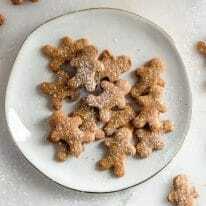 While cookies cool, for the glaze, pulse monk fruit sweetener in blender or food processor until powdered. Melt coconut oil in microwave and, once melted, add to powdered monk fruit sweetener. Pour in 2 tbsp coconut milk and pulse in blender until well-combined and a glaze forms. If glaze mixture is too dense, add additional tbsp of coconut milk. Transfer glaze from blender to shallow dish or plate. Carefully dunk top of cookies in glaze and set on cooling rack to harden. I have the Lakanto powdered monkfruit, can I use that for the frosting and if so would it be the same amount? Thanks!! Hi, Patti! You can use the powdered monk fruit sweetener at a 1:1 ratio in this recipe! And then just skip the step of powdering the sweetener in a food processor. Enjoy! If I used cocunut from a can would it change the flavor or texture? Also if I were to use Erythritol how much would I use? Hi, Ciara! Canned coconut should sub in just fine for the glaze! Erythritol subs in for monk fruit sweetener at a 1:1 ratio. Enjoy! Is the coconut milk from a can or carton type of milk? Great question! Coconut milk from a carton. Thanks, Lisa!